Chopping wood doesn’t take a lot of energy or strength. What’s needed the most is patience, stamina, aim, the right tools and a bit of common sense . Safety, though, always needs to be heeded when yielding an axe. Chopping wood is not the same as splitting wood. 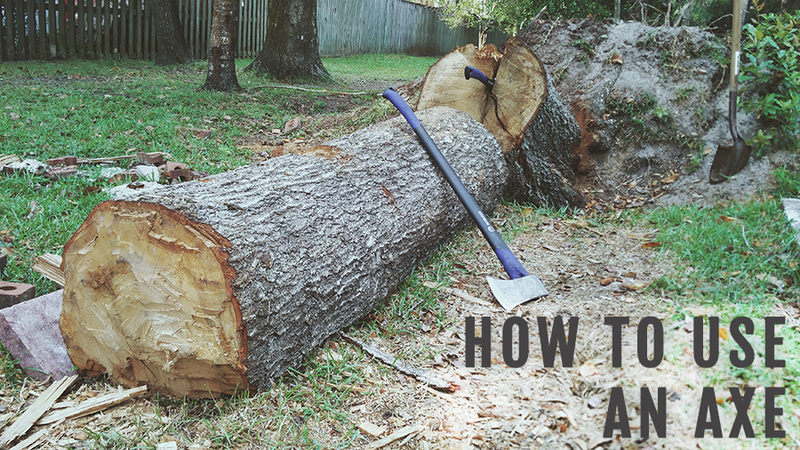 For this article, we’ll be covering on how to chop through wood with an axe from a fallen tree or large branch. If you live in an area that’s wooded and have frequent encounters with large gusts of winds from hurricanes, you may experience fallen trees or branches speckled around your neighborhood or home. After Hurricane Irma, the city of Keystone Heights‘ streets were literally littered with branches, leaves and tree debris, making driving almost virtually impossible. But luckily, Keystone Heights is an area that the city workers are quick to clear paths and reclaim normalcy quickly. The days after Irma passed there was a din of chainsaws filling the air – everybody was out clearing their property and streets. Luckily, our house was spared from the hurricane and only a large tree fell down and crashed through our wood fence. We hired a reliable and inexpensive company to cut the tree for us and clear most of its branches from our lot and our neighbor’s. I told them to leave for us three four-feet long logs (we wanted to make benches out of them), and I told them to leave a seven foot log where it was sawed – I wanted to chop this piece with an axe for exercise and achieve a prolonged satisfaction after I’ve finally cut through. So, let’s get right to it and learn how to properly use an axe when chopping wood. Like everything in life there are the right tools for a task. A screwdriver screws in nails screws (I mess up too at times – no one is perfect). But all joking aside, the right tool will save you time, minimize the chances of getting injured and alleviate tons of stress. When chopping wood the right tool is an axe not a maul (a maul axe or “wood splitting axe” is ideal for…drum roll please…splitting wood). The most visible difference between an axe and maul would be the head of the axe. A chopping axe head is sharp and thin. You’ll notice that where the metal meets wood (or fiberglass) handle is almost flush, while the maul you’ll notice a blunt bulky head. An axe is ideal for chopping through the fibers of the tree. By using aim, physics and well-placed strikes to the tree you’ll eventually chop right through the tree. While the idea of chopping trees only in boots and a trapper hat is idyllic, there is a better, safer and less embarrassing way to chop wood. gloves – not with a rubber palm or anything that may cause friction – you’ll want a material that is able to slide down the handle with a semi-amount of friction; good enough to have control of axe and able to get a good grip of the handle (don’t use silk gloves, the axe will fly out your hands). Boots or sneakers. Need something that won’t cause slippage while handling axe, preferably not sandals. Eye protection – goggles used at shooting ranges is ideal; some form of eye protection that will prevent flying chunks of wood from piercing your eye. Hat – if it’s sunny, this will help block the sun and will keep projectable wood chunks from ending up in your hair. We’ll be chopping wood that’s on the ground. If the log isn’t very thick, you’ll want to prop it up a foot to gain a more forceful strike and to not over exert your back. First: one hand (palm facing you) grabs hold of the axe at end of handle and the other hand (palm facing away) just below axe head. Spread your legs, feet a little more shoulder-width. Second: hold the axe horizontally in front of you by your waist. Third: raise axe in the direction of the hand that’s below the axe head. So, in my case, my right hand is under the axe, I raise the axe in a fluid motion towards the right side of my body. As the axe is approaching above my head, I’m concentrating on centering the axe (bring both hands and axe perpendicular to you). As the axe is at its apex, the axe should be directly at the middle of your body and your body straightened. Forth: you’re ready to strike – remember step three is cocking your strike, while this step is firing it. As you are bringing the axe down, the hand below axe head will slide down shaft of handle where it will meet your other hand. As you are swinging axe down, your legs should be bending at knees – this will add a greater force to your strike. Fifth: as the axe is going down, bend your knees a bit more and have your back move slightly forward. Sixth: on impact keep arms and hands locked – you’ll want to do this to secure your axe from bouncing to the sides or back at you. Video below gives you a visual on how to swing the axe. The video shows how to split wood with maul axe, but because the wood you are chopping is on ground this method can be used to chop wood. Aiming is important. By hitting your target with each strike, you’ll be getting closer and closer to chopping your way through the wood. If you don’t concentrate on your mark you’ll spend energy and days attempting to cut through. Before cocking your swing, eye your target on the wood. Center your body on target. Bring axe up always looking at where you’re going to strike, then on swing down direct your hands towards target. Aiming will get easier and easier with each attempt. The learning curve is minimal. When it comes to chopping you want to make pie slice sections in the log (like triangles). On first chop keep blade straight, strike straight into wood. On second chop, aim a bit to the right of where the first swing struck, just a inch or two away. Angle axe a bit to drive axe blade towards the first hit. On third chop, follow the same method as second, only instead of right you are aiming for the left of the first mark – repeat until you have made a triangle. By following the pie slice cuts you’ll be able to cut through a reasoably thin log. However for larger logs you’ll have to pie slice around the log. And once you have heard that “oh so gratifying” and recognizable sound of wood breaking apart, then you have successfully chopped wood.